Dr Pedro Fidelman is a postdoctoral research fellow with the ARC Centre of Excellence for Coral Reef Studies at James Cook University. The notion of social norms and rules (or institutions) that govern human-environment interactions is central to Pedro’s research. He is particularly interested in examining how systems of norms and rules, at different scales and levels of organisation, can be employed towards more sustainable environmental governance. Pedro is also interested in how socio-ecological systems adapt to environmental, socio-economic, political and institutional change. The term commons, or common-pool resources (CPRs), refers to a diversity of resources involving some aspect of joint ownership or access. 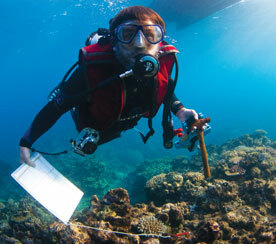 CPRs include, for example, coral reefs, fisheries, biodiversity, threatened species and marine protected areas. Because exclusion from resources is costly and one person’s use subtracts from what is available to others, CPRs are subject to overuse, and, consequently, degradation. Solving CPRs’ problems has been traditionally linked to arrangements evolved locally, devised by stable communities, and buffered from external forces. Complex commons are, however, large-scale, encompassing multiple and interlinked resources; are influenced by intricate sets of endogenous and exogenous forces and relationships; involve various users and political actors and different levels of social organisation. Devising institutions to regulate complex commons can, therefore, be a very challenging task. This seminar will draw on the concept of complex commons to examine potential challenges to the governance of medium/large-scale marine systems. The Coral Triangle will be used as a case study. It presents characteristics of complex commons, is regarded as the earth’s epicentre of marine life, and a global priority for conservation. By understanding marine systems as complex commons, it may be possible to distinguish promising institutional arrangements from those unlikely to achieve desired governance goals.